The Battle of Tai'erzhuang (simplified Chinese: 台儿庄会战; traditional Chinese: 臺兒莊會戰; pinyin: Tái'érzhūang Huìzhàn) was a battle of the Second Sino-Japanese War in 1938, between armies of Chinese Kuomintang and Japan, and is sometimes considered as a part of Battle of Xuzhou. Tai'erzhuang is located on the eastern bank of the Grand Canal of China and was a frontier garrison northeast of Xuzhou. It was also the terminus of a local branch railway from Lincheng. Xuzhou itself was the junction of the Jinpu Railway (Tianjin-Pukou) and the Longhai Railway (Lanzhou-Lianyungang) and the headquarters of the KMT's 5th War Zone. The battle involved a Japanese plan to conquer Xuzhou, a major city in the East. However, the Japanese failed to consider the plans of generals Li Zongren and Bai Chongxi, who planned to encircle the Japanese in the town of Tai'erzhuang. The Japanese operation started on 24 March. Overconfidence led the Japanese commanders to overlook the thousands of inconspicuous "farmers" in the area, who were affiliated with the Communists and cut communication lines and supplies, diverted streams, and ruined rail lines. By late March, supplies and fuels were being dropped from airplanes to Japanese troops, but the quantities were insufficient. Finally, the Japanese attacked frontally, failing to consider the greater Chinese numbers. A major encirclement on April 6, with Chinese reinforcements, preceded a major Japanese retreat, which the Chinese failed to capitalize upon through pursuit due to a lack of mobility. Amid the celebrations in Hankow and other Chinese cities, Japan denied and ridiculed the reports of the battle for days. It was reported in the world's newspapers, however, and by mid-April had provoked a Cabinet crisis in Tokyo. 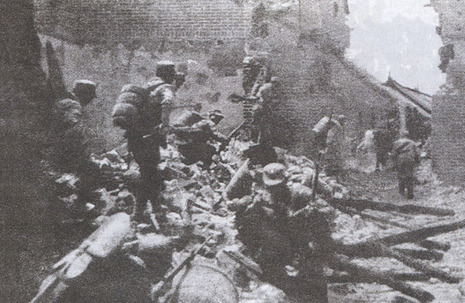 After arriving at Tai'erzhuang, the Chinese 31st Division's 91st and 93rd Brigades fortified the area. From the 93rd Brigade, the 186th Regiment guarded the town center and 185th in the villages of Beilou and Nanlou to the north; from the 91st Brigade, the 181st Regiment dug in at the railroad station on the north side of the town and the 182nd patrolled the southern bank of the canal.